Just because it’s tradition, doesn’t mean it’s right! 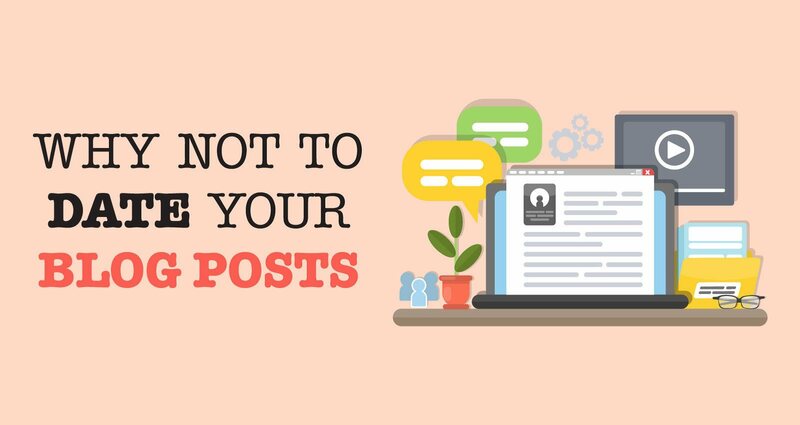 And in the case of dating your blog posts, there are lots more disadvantages to putting dates on your blog posts than there are advantages. Think through your last year of blogging. What percentage of your posts really needed to have a date attached? Unless you’re a cutting edge blogger on highly time-sensitive issues, (most of us aren’t) those dates on each of your blog posts probably hurt you more than they helped you. Even if the content that you wrote is evergreen – not time-based at all! As a consequence, they immediately, before they’ve even started reading, have been negatively predisposed against the information you are presenting in the post. Is that what you want to burden yourself with? I could give you lots more reasons, but I won’t. With one exception – what if you’re a busy person who’s committed to blogging, but just doesn’t get to it every day? By putting dates on all of your posts, you clearly point that fact out to everyone else. I know, the purist bloggers are hating me for saying this, but why would you want to advertise the fact that you don’t post every day? Note: I’ve received so much feedback from this post that I’ve written a companion post here: Why NOT To Date Your Blog Posts Revisited. Check it out! Now, don’t get me wrong, there are concepts that should definitely be dated. If you’re giving investment advice on which stock to buy right now, links to coupons, software updates or anything else that’s truly time-sensitive, you owe it to your audience to have a date in the post. So how do you get rid of the dates on your posts? Watch this 5-minute video to learn how. Finally, remember that not everyone agrees with this strategy – that’s terrific! Make your own choice whether you implement it or not! Update: if you find that the solution recommended in the video doesn’t solve your problem or if you need to remove dates from comments, you can always go deeper and edit the .php files. Here’s a blog post that shows how to do that. Do you have any other suggestions for removing dates from blog posts? Let me know by leaving a comment below. And don’t forget to like and tweet it! I’ve received so much feedback from this post that I’ve revisted the concept here: Why NOT To Date Your Blog Posts Revisited. Check it out!